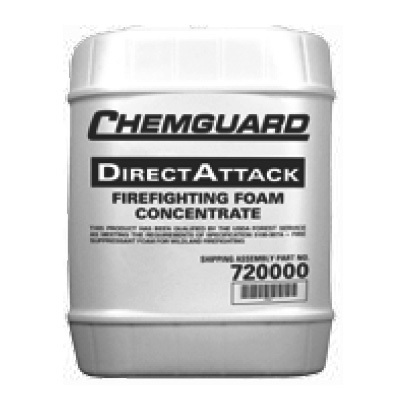 DIRECTATTACK foam agent concentrate is a Low-, Medium-, and High-Expansion Foam, Class A fire control foam concentrate formulated from specialty hydrocarbon surfactants, stabilizers, corrosion-inhibitors, and solvents. The foam agent solution has been proven effective on many deep-seated Class A fuel fires, such as tire fires, paper fires, coal fires, structure fires, and wild fires. The foam agent also provides superior cold weather performance. DIRECTATTACK foam agent concentrate can be proportioned from 0.1% to 1.0% in fresh, brackish, or sea water. When used as a pre-mixed solution, only fresh or potable water should be used if the premix is to be stored over long periods of time. Because of the extremely low proportioning rate, the foam agent concentrate offers outstanding economy in concentrate storage space, cost (compared to conventional 3% and 6% foam agents), and water hauling requirements. For example, a 5 gal (19 L) pail of foam agent concentrate produces 500 gal (1,893 L) of fire control foam agent solution at 1% concentration and produces 5,000 gal (18,927 L) of foam agent solution at 0.1% concentration. Reduction of the water surface tension provides the foam agent solution with superior wetting and penetrating characteristics. This helps make Class A fuels less combustible and allows the solution to penetrate past the char to help control deep seated fires. 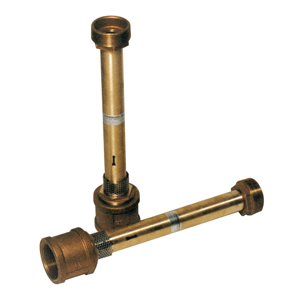 Extended drain time provides longer surface wetting, reducing the risk of ignition / re-ignition. Creation of a dense foam blanket which provides an insulating barrier between the fuel and air. Suppression of combustible vapors while cooling the fuel. Forms a brilliant white foam that reflects heat. High viscosity allows foam to cling to vertical surfaces for increased protection. Applicable suppression mechanisms and some properties of DIRECTATTACK foam agent solution depend on the type of foam delivery device used. The foam agent has a reduced environmental signature and does not have any EPA reportable contents. Foam agent does not destroy or retard new forest growth. Foam agent will not harm fish or wildlife. Foam agent is biodegradable in soils, aquatic ecosystems, and sewage treatment facilities. DIRECTATTACK foam agent fire suppression concentrate is designed specifically for use on Class A fuel fires including wood fires, paper fires, coal fires, structure fires, and rubber fires. Foam agent gives the fire fighter suppression capabilities, exposure protection, and increased safety. 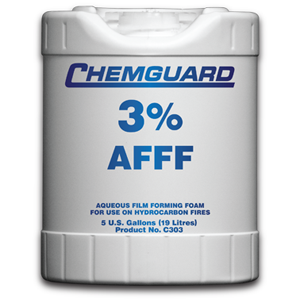 Although designed for Class A fires, foam agent can be effective on some Class B flammable liquid fires when applied by Medium- and High-Expansion devices. Foam agent can be used with aspirating and non-aspirating discharge devices, compressed air foam systems (CAFS), or dropped from fixed or rotary wing aircraft. For comparison purposes, the viscosity of 10W40 motor oil is 160 centistokes at 77 °F (25 °C) and 800 centistokes at 12 °F (–11.1 °C). Foaming Properties When used with fresh, sea, or brackish water at the correct proportioning rate, the expansion will vary depending on the performance characteristics of the foam making equipment. Proportioning DIRECTATTACK foam agent concentrate can be proportioned using most conventional proportioning equipment. DIRECTATTACK foam agent concentrate should be stored in the original packaging supplied (polyethylene drums or pails) or in equipment recommended by the manufacturer as part of the foam system and within the temperature limits specified. 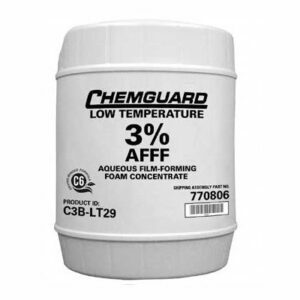 The recommended storage temperature for foam agent concentrate is 30 °F to 120 °F (–1 °C to 49 °C). If the product is frozen during storage or transportation, thawing will allow the foam agent concentrate to be used. Consult with Tyco Fire Protection Products before mixing DIRECTATTACK foam agent concentrate with other manufacturer’s products. Tests have been performed with DIRECTATTACK foam agent verifying its compatibility with the steel, stainless steel, yellow brass, magnesium, and aluminum alloys found in aerial and ground-based firefighting equipment. The foam agent is also compatible with standard fire fighter turn out gear and hose material. The standard procedure for flushing with fresh water should be used with all equipment used with foam agent concentrate or foam agent solution. Contact Tyco Fire Protection Products regarding availability of bulk truckload deliveries. CHEMGUARD, DIRECTATTACK, and the product names listed in this material are marks and/or registered marks. Unauthorized use is strictly prohibited.